Gender equality is embraced by the international community as the cornerstone of sustainable development and remedy against poverty and social exclusion. The Czech Republic is very vocal on human rights but this study looks into how the Czech commitment towards gender equality is put into practice. 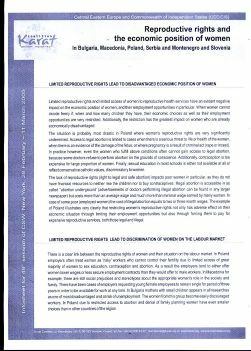 Infosheet: Women’s access to justice in Central and Eastern Europe and Central Asia (Also in Russian). 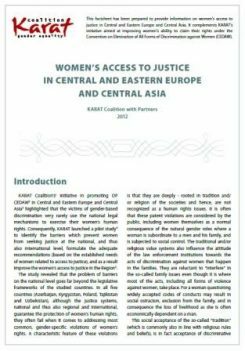 This infosheet provides information on women’s access to justice in Central and Eastern Europe and Central Asia. It complements KARAT’s initiative aimed at improving women’s ability to claim their rights under the Convention on Elimination of All Forms of Discrimination against Women (CEDAW). Five briefings were prepared by the project “Connect! South East West Women for Development Building Support in New Member States for Gender-sensitive and -responsive European Development Co-operation”.